Wondering how to cook a turkey for Thanksgiving or Christmas? If you're like most of us, you've cooked a turkey for the holidays only to find it was dry and tasteless. When cooking turkey it is very important to PLAN AHEAD! Here are some turkey tips so that you can buy and cook a succulent and delicious turkey for the family. What size turkey do I buy? When buying a whole turkey, first work out how many people you are serving. Allow about 1 1/4 pound of turkey per person. This will be plenty for the holiday meal with extras for leftovers. If you don't like too many leftovers, only allow 1 pound per person. Turkey Tip: Make sure your fridge, roast pan, and oven are big enough to fit your turkey! Frozen turkeys are the most economical and they are readily available at your local grocery store. Frozen turkeys, if thawed adequately, can taste perfectly fine. You must buy your frozen turkey in advance, calculate your thawing time (see tips below) and begin thawing on time. Some people argue that fresh is best when it comes to buying a turkey. One benefit to buying a fresh turkey, of course, is there's no thawing time! A fresh turkey will be more expensive. If you go fresh, order your turkey in advance. You can even order direct from the turkey farm. There are many choices available now. A free range turkey is allowed to roam around as opposed to a regular commercial turkey that is mostly caged. Apart from the environmental sustainability and ethical reasons for buying a free range turkey, the turkey meat is considered to be more moist. Some free range and also organic turkeys also are free of artificial additives and hormones. One of the issues with a free range turkey is that the turkeys are more muscular after all that roaming around so the meat can be tougher. Traditionally, free range turkeys were first boiled or poached then browned on a spit barbecue to add the crispiness. Turkey Tip: Cook free range turkey wrapped in aluminum foil to "steam" the turkey meat, removing the foil in the last half hour of cooking so it will be crisp on the outside and tender on the inside. Many brands of turkey have extra ingredients injected into the flesh to make the turkey more moist or to enhance the flavor of the turkey. These often include artificial flavors and chemicals, extra salt, extra fatty substances, and extra sugars such as corn syrup. I believe that if you cook a turkey well then you don't need those "extras" that can add extra calories to the meal and can even cause allergic reactions in some people. Turkey Tip: Read the turkey label and scan the ingredients to avoid additives. 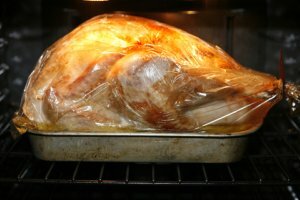 How long do I thaw a frozen turkey? Always thaw a frozen turkey in the fridge. NEVER thaw at room temperature or you will risk making your family and guests ill. Also do not attempt to thaw your turkey in the microwave. Allow about 5 hours per pound for a frozen turkey to thaw. There are different schools of thought on stuffing a turkey or any poultry. I recommend you do not stuff the body cavity. It's just too risky to your health because it's very difficult to get the temperature in the middle of the turkey to rise high enough to destroy the harmful bacteria that can cause food poisoning. Turkey Stuffing Tip: Stuff only the turkey neck and cook stuffing or dressing in a separate dish. To Baste or not to Baste? Basting a turkey is a cooking technique where the turkey is cooked in juices, sauce, butter or oil to keep it moist and add flavor. For juices you can use a turkey baster and for butter or oil use a brush to baste your turkey. Turkey Tip: Check your turkey label - if it says "pre-basted" or "self-basting" it has been injected with solution and you don't need to baste. There are many who now believe basting your turkey is of no value since you lose heat by opening the oven constantly which means longer cooking time and a possibly drier turkey. They also argue that the juices do not penetrate the skin and aren't even absorbed in the flesh of the turkey. If you do baste, remove the turkey from the oven quickly, shut the door and cover the turkey in liquid, then put it back in the oven quickly and only do this once or twice at most. There's no need to baste if you rub your turkey in plenty of butter or vegetable oil (I prefer extra virgin olive oil) and cook it in a plastic oven bag. The juices of the turkey will keep it wonderfully moist and you can use the drippings from the bag to make gravy. Best of all, it's an easy clean up. My grandmother cooked the turkey in a paper bag. I don't recommend this because the paper can actually catch on fire in the oven and you don't know what kind of chemicals can leach from a paper bag. If you use foil, make sure the foil is folded tightly over the edges of the pan so the steam doesn't escape and you don't loose the moisture. This prevents the turkey from drying out. I've tried all methods and the oven bag is my favorite way to cook a turkey. You just can't beat the super moist results. Turkey Tip: Cook your turkey upside down with the breast on the bottom so the beautiful juices from the back and legs will drip down to moisten the breast. How do I know when the turkey is fully cooked? First use your cooking guide to work out the time to cook the turkey based on the weight. Then when you reach the calculated cooking time, remove the turkey from the oven and use a meat thermometer by sticking it into the thickest part of one of the thighs (don't touch the bone). When the meat thermometer shows 375F degrees, the turkey is cooked. If you don't have a thermometer, another way to test if it's done is to prick part of the thigh to release juices into a small bowl or large spoon. If the liquid is clear (no blood) then it's ready. I hope you've found these turkey tips helpful and that I've explained how to cook a turkey so that your Thanksgiving meal is perfect!